Alberta Premier Rachel Notley announced the ban as the next step in a dispute with B.C. over the Trans Mountain pipeline expansion. Saskatchewan premier Scott Moe speaks with reporters following the swearing-in ceremony in Regina on Feb. 2, 2018. REGINA — Saskatchewan says it will not be joining Alberta in banning the import of British Columbia wines. Alberta Premier Rachel Notley announced the ban on Tuesday as the next step in an ongoing dispute with B.C. over the Trans Mountain pipeline expansion. In a statement on Facebook, Saskatchewan Premier Scott Moe says that while his province supports Alberta in its fight, he doesn't think the dispute will be solved by trade measures that have an impact on consumers and private businesses. B.C. has said it is considering rules to limit any increase in the shipping of diluted bitumen until an independent panel can better analyze whether the system is safe and can adequately deal with a spill. The Trans Mountain project has already been approved by Ottawa and Notley sees B.C. 's move as a back-door way to scuttle the expansion. The $7.4-billion Kinder Morgan project would triple capacity on the 1,150-kilometre line, which runs from Edmonton to the B.C. coast. We do not believe this matter will be resolved by trade measures that will primarily impact consumers and private businesses. Moe suggests that rather than boycott B.C. wine, Saskatchewan will look at options either through the courts or interprovincial trade agreements. "It is our position that the government of British Columbia has no legal jurisdiction or justification to delay or impede the construction of the Trans Mountain pipeline,'' he said. 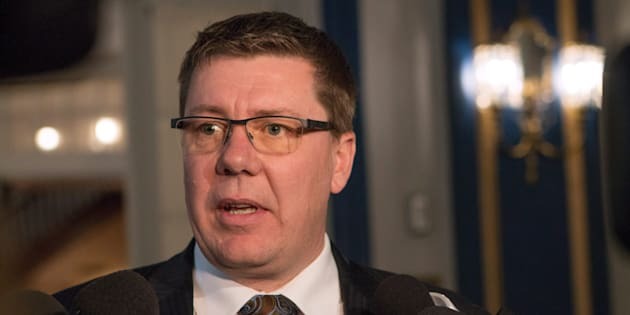 "While we have previously stated that Saskatchewan will support Alberta in defending against this attack on our energy industry, Saskatchewan has no plans to participate in retaliatory measures that would be in contravention of our trade commitments. "We do not believe this matter will be resolved by trade measures that will primarily impact consumers and private businesses."